ISLAMABAD: Chief Justice of Pakistan Mian Saqib Nisar, while hearing a suo motu case regarding the cutting of trees on Margalla Hills remarked that judicial reforms would be launched from next week, but warned that “nobody should say then that [the judiciary] is interfering or encroaching”. State Minister for Capital Administration Dr Tariq Fazal Chaudhry appeared before the Supreme Court, after being summoned by the apex court over the failure of the Capital Development Authority (CDA) to develop rules and regulations. The CJP, during the course of the hearing, inquired how much time the CDA would require to set its house in order. To this, Chaudhry asked that the court allow three months. CJP Nisar observed that rules and regulations had not even been drawn up for several situations. He then allowed two months to the CDA and instructed the officials to work day and night with sincerity to draw up the rules. “What reforms did the parliament introduce? 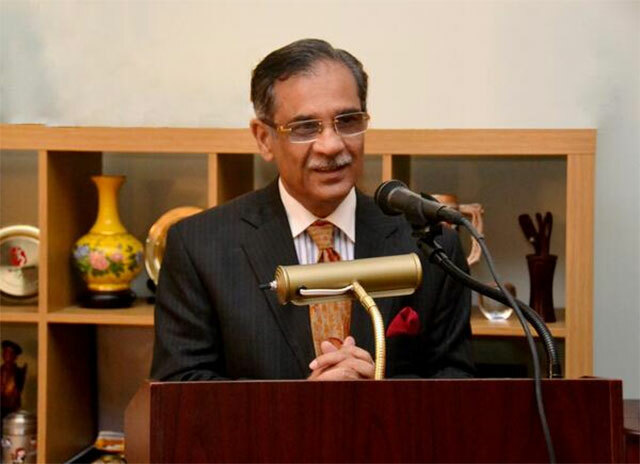 We will bring reform in the judicial system,” the CJP remarked, adding that the reform would begin from next week. The SC bench sought an explanation from Pakistan Medical and Dental Council’s (PMDC) former vice-president Dr Asim Hussain on why he devised policies that benefited private medical colleges. The chief justice also noted that malpractices at private medical colleges have eroded the value of Pakistani degrees at international level. “We don’t get respect at international universities because our degrees have lost their value,” Chief Justice Nisar said, adding that the court wanted to know how many private medical colleges were founded in accordance with the law. The bench also clarified that the case didn’t just concern institutions in Punjab but has a nationwide applicability. The court also issued a notice to the PMDC and adjourned the hearing until Tuesday.